Welcome to Monticello Carpet & Interiors, your complete source for interiors. Our convenient location in the quaint small town of Monticello contains everything you need to design or remodel your home. We sell custom flooring, cabinets, countertops, paint, window treatments, wallpaper and fabulous home accessories. We’ve improved the interiors of many homes and commercial spaces. We’ll help design the perfect space to make your house a home. We look forward to helping you design your new look! Please visit our facebook page to see our current specials, and browse our website to see our wide array of beautiful product offerings. Thanks for stopping by – we look forward to seeing you in our store soon! 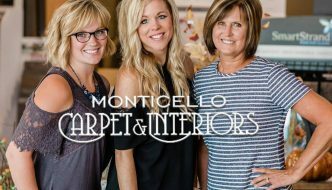 Sandy Moats, Manager, and Tara Koelker and Callie Fagan, Designers, are the faces and talent behind Monticello Carpet and Interiors. Our team works together to provide the perfect look for your home or business. 🌳 Solid and Engineered hardwood floors are known to enhance the look and value of homes due to their versatility in various interior design settings as well as improve air quality since they won’t trap dust, dander, and other allergens. SOLID hardwood is a timeless luxury flooring that can be refinished for its lifetime in your home. ENGINEERED hardwood flooring remains stable and resistant to variations in temperature and moisture which makes it a great option for any room or level in your home.